The USR (Ufficio Scolastico Regionale per la Puglia) comes under the authority of the Ministry of Education. This Regional Office for Education is engaged in several institutional activities in the aim to promote active citizenship within the range of the key competencies described by EU in the 2006 Recommendations. Referring in particular to the cultural awareness competence, the USR promotes a best knowledge of local linguistic and cultural tradition in order to individuate which elements of the local culture can meet other EU countries . To reach this goal, during the last years, the USR has projected many activities and promoted and supported schools of the regional area to achieve the outcomes associated with this goal. The Comprehensive Institute of Corigliano d’Otranto, engaged in European projects (Comenius Multilateral Partnerships and e-Twinnig) since 2001 and “gemellato” with the city of Ilion (Greece) since 2008, desires taking part in this Comenius Regio project , which enhances the Dimension of European Education, to give continuity to the itineraries taken previously that have been motivating, enriching and constructive for students/staff and the whole local community. The Institute wants to continue, therefore, to develop in the new generations the sense of belonging to a Common European Citizenship through the knowledge of cultural, historical, artistic and territorial heritage of the two communities: the city of Ilion and the region of Apulia. The Institute can also count on the cooperation and support of Local Authorities, university experts and cultural/artistic/linguistic/environmental association members. The partnership will create opportunity for the partners to discover possible cultural roots and, at the same time, similarities and differences. All of these will lead to deepening intercultural dialogue among the participating regions. The Municipality of Corigliano d’Otranto, consisting of a young and competent administration, is actually engaged in the promotion of the territory and cultural development of their community. 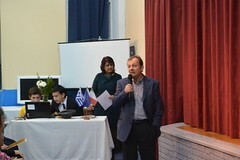 The Municipality implements all their efforts to: ensure social cohesion, implement the right to education and to health, increase in quantity and quality services for citizens, invest in the eco-sustainable development of the territory, enhance the artistic, cultural, monumental heritage, through the use of “Castle de ‘Monti,” the center of the community social life, organize various cultural events to preserve and pass on traditions and local customs, create opportunities for cultural exchange at local and international level. The Agency for Euro-Mediterranean Cultural Heritage was established in March 2003, on the initiative of the Municipality of Lecce within the European Cultural Heritage II. It aims to enhance cooperation in the field of conservation, restoration and management of cultural heritage and to promote actions and permanent collaboration in support of policies for the protection of the cultural heritage of the Euro-Mediterranean States. The Agency carries out actions aimed at the protection, restoration and conservation, enhancement and promotion of the material, immaterial and linguistic Mediterranean cultural heritage , including through support and dissemination of the policies of nation-states and international organizations. The Agency cooperates and collaborates with organizations, institutions, public and private entities to request permanent actions to support policies aimed at interventions in order to discover, recognize and appreciate the cultural heritage as a vehicle of identity and integration between the different areas of European Union and the Mediterranean. The Salesians are in Corigliano for a very long time. Their presence in the territory has been realized through educational, cultural and sport activities. Since the seventies their work has taken place firstly in the animation of local children and young people through the Oratory Youth Centre and, secondly, in the reception of children in serious personal and family difficulties. The Oratory Youth Centre in Corigliano involves with its initiatives the majority of children and young people in the town all year long. It proposes and carries out education and training activities according to the Preventive System of Saint Giovanni Bosco. The Association “Piccolo Teatro Coriglianese” was founded in 1995 thanks to the passion for theater of a group of friends. 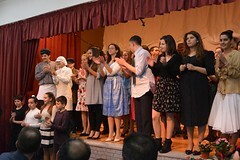 It’s a non-profit organization, dedicated to the popular Salentine theater which aims to discover, develop and pass on local cultural traditions and customs, through a series of comedies in dialect that record great attention among audience and experts. The association is often invited by neighboring administrations in various local festivals and has won several awards and accolades. “CIRCOLO ARGALÌO” is a non-profit cultural organization, founded in the early 70s in Corigliano d’Otranto, one of the villages in the province of Lecce, that form the linguistic grecofona area “GRECIA SALENTINA”. “ARGALÌO” in griko indicates the loom, an ancient tool with which the women wove the cloth to sew clothes or the dowry for their daughters. The main aim of “ARGALÌO” is to preserve, enhance and promote “griko” language and popular traditions, “weaving” an ideal link between the past and nowadays actuality. 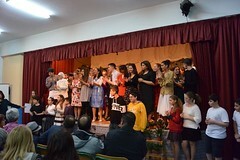 The Orchestra Sparagnina was born in 2006 within the educational experiences of the Comprehensive Institute of Corigliano d’Otranto dedicated to the discovery of cultural identity and the recovery of an ancient Greek dialect “GRIKO” still used in some areas of the Salento, including Corigliano d’Otranto. It consists of thirty young singers and musicians. 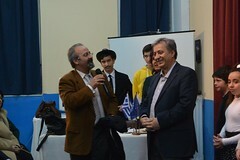 They started with their teachers at school and with the assistance of the famous national conductor Ambrogio Sparagna.